The NDEx Project | The NDEx publication is out! The NDEx publication is out! 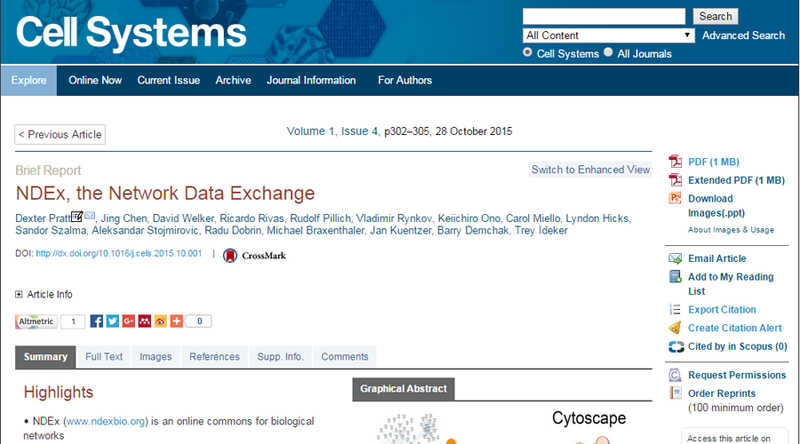 The NDEx Team is proud to announce that the first NDEx paper has been published in the October 28 issue of "Cell Systems". Two full years of work, meetings, testing and constant interaction with users and stakeholders have helped us reach this important milestone… Thanks everyone for your hard work! And we are sure you all agree on the fact that hard work deserves recognition: if you use NDEx for your work, please make sure to cite us! Citation information can be found in the About page of our website. CLICK HERE to access the full text article on the journal's website as well as download a PDF version of the paper.